Huge, just simply huge. The Ft. Lauderdale, FL expo was an absolute huge success. Making as successful an attempt at blogging such a technologically drenched marine expo as it was in the reality of the moment, will be a Herculean task. The only problem being is, you are stuck with me on this one. Best to start with a sunny Monday of January 11th at 12 noon for the opening, where, in the lobby, there stood a great business colleague Robert Aronnson standing with Dr. Barry Iseard and Alex Rodriquez of Apollo Energy Systems. After extending cordialities the decision was made to individually walk the show, then meet the next day at AES headquarters and discuss the expo, among other business interests. More on that later herein. The attire for attendees as well as exhibitors and guest speakers was casual but the the roster of all those there was all but casual. If you can imagine the top designers, engineers, executives of cruise lines, freighter lines, work boat & tug builders, naval architects, maritime/homeland defense, armament scientists/engineers, port systems management, commercial and consumer boats and ship executives, then your mind is in the right place. Robert Aronnson CEO, AES, & Dr. Barry Iseard AES scientist. So what is the point for the 3 day expo? Simply to get all the designers and users into a convention hall to sample the smorgasbord of new types of batteries, electric & electronic control systems, electric & hybrid internal combustion engine systems that are more clean, economical, durable, of greater ROI, and less complex. Modular systems with greater service life. All that and more good tech, any red blooded boat captain would love to have for replacement of their current running gear. How about a few hundred horsepower electric motor in a sterile case with no dipstick, oil, fuel drips or intake cleaners, as pictured below? Looking more like a spaceship gun than a motor, the LTS unit can play the field for many different marine installation types from very fast runabouts to sizable cruisers and trawlers. 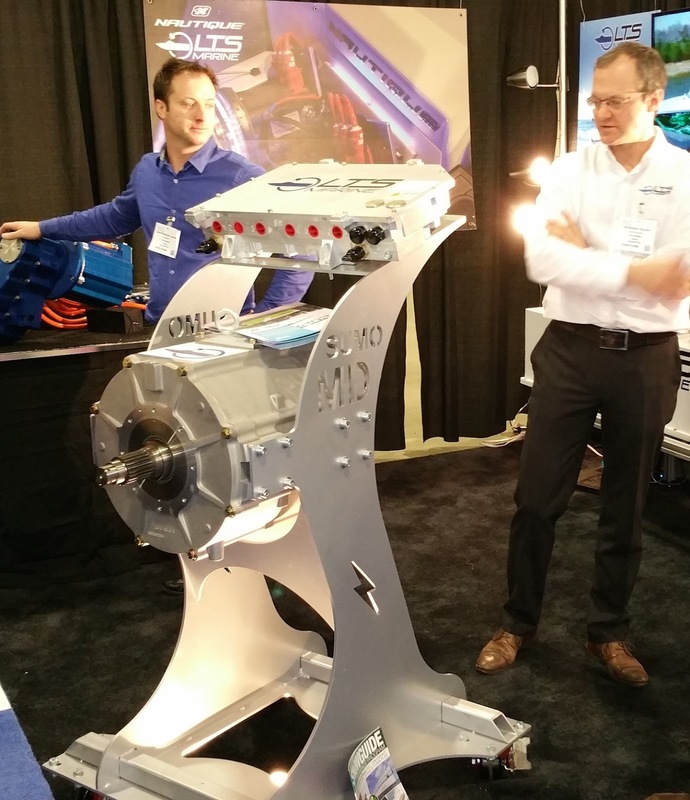 One motor for many applications makes design and implementation much more smooth. Smooth and silent also fits well for the Navy or the yacht owner. A lightweight aluminum stand supports a svelte electric motor. with the controller box mounted above, switch on & go. You ask, what is for fuel/power for all the new electric motors and the electric motors coupled with combustion engines (hybrids)? Batteries and fuel cells are the answer. there were booth displays from over a dozen electric power storage systems, not to mention a bunch of very smart engineering and manufacturing firms creating specialty systems for the marine environment. 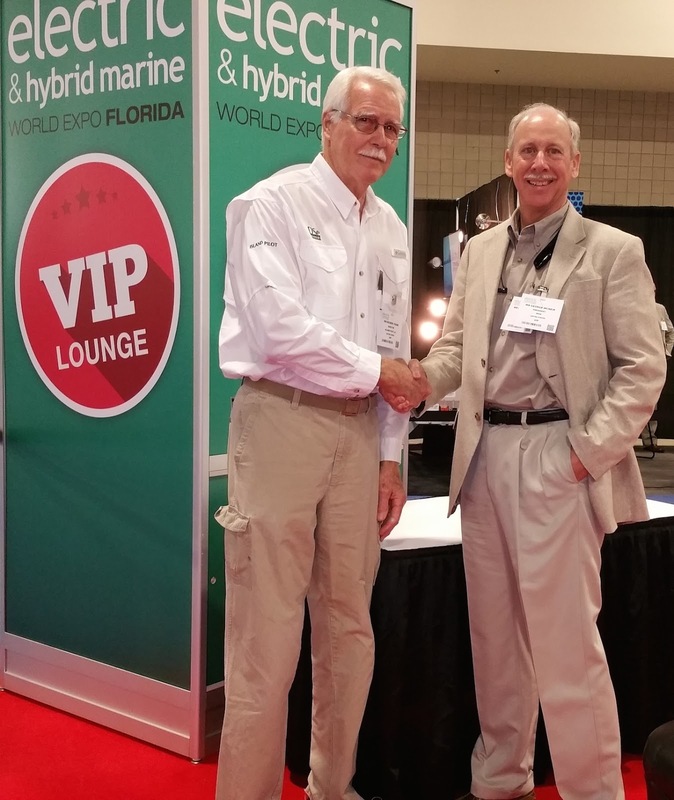 The European countries have pooled their talents and money to get a head start on the electric & hybrid marine market, alighting in Ft. Lauderdale for this expo to show their expertise. Firms from the UK, Germany France and other counties on the continent flew the pond to broaden the expo's range of offerings. Orion from France, presented their control systems and engineering talent. The show was actually open to the public but the overwhelming attendance was corporate tech and executive designers and recommenders. However, if you were there, the apparent direction of maritime power would be obvious, a new departure was at hand, prompting questions such as, will this be on my yacht soon? Yep, sooner than you might think. One player in that consumer yacht market application is the man behind Island Pilot yachts, Reuben Trane, with whom I had the pleasure to sit and converse a bit. 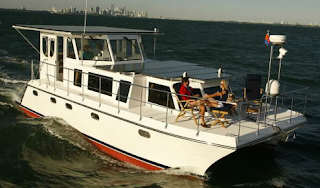 He is a most inventive, creative and technical force in the boating world. 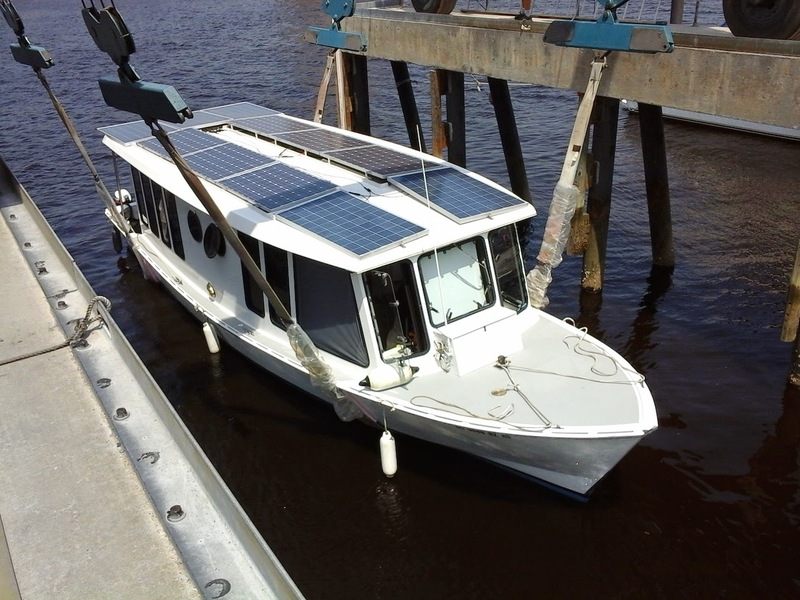 At the same time he is very market savvy, having placed in the water a number of fully functioning electric-hybrid yachts. 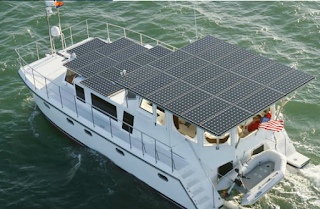 One of the early integrators in the technology and art of electric and solar boat power, Reuben created the correct wake for the industry to follow. with distinguished presence and knowledge. hybrid, catamaran yacht designed by Rueben Trane. 40 foot MOG boat prototype with updated solar array. We will be adding more to the blog this week. Hold fast, we are getting the new news ready for you to see.